Stocks offer an opportunity for increasing your capital, but since the prices of stocks can vary substantially and lose value, you should first put aside an emergency fund with three to six months' living expenses. This can be anywhere from $10,000 to $30,000 Dollars, depending on your income and budget. The money in this emergency fund should be placed in an insured savings account and should not be used for investments that may lose value. The spectacular rise of Internet stocks which peaked during 2000 was based on great hopes but unproven business models. 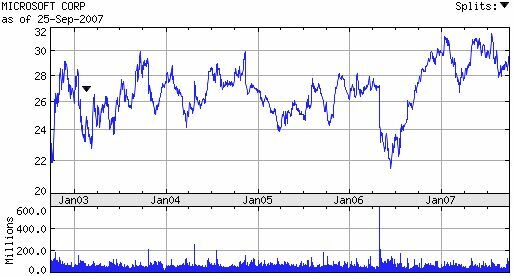 At the peak of the frenzy, on January 3, 2000, Yahoo(YHOO) stock had a value of $237.50 per share. As early as 1996, Federal Reserve Board Chairman Alan Greenspan had asked "how do we know when irrational exuberance has unduly escalated asset values, which then become subject to unexpected and prolonged contractions?". The answer came when the dot-com boom ended and prices started dropping precipitously through 2000, 2001, and part of 2002. Those who entered the market late and those who bought hoping that the stock prices would soon recover suffered great losses. In October of 2002, when Internet stocks started growing in value again, Yahoo stock was valued at only $9.39 – less than 4% of its highest value. A conservative investment strategy requires looking at the overall performance of a company, its business models, its competition, and economic measures like sales, profits, and dividends. Most of this information is readily available free of charge from web sites such as Yahoo! Finance. You can make the most profit by investing all your money only in the best performing stock, but it is impossible to know how long the trend will continue and when to sell to lock the profit. Diversification makes it possible to reduce the overall risk of a portfolio as various sectors of the market experience downturns. You can diversify with different asset classes such as stocks and bonds which produce the returns under different market conditions, or with different industrial sectors, e.g., manufacturing, energy, financial, technology, communications, medical, etc. One strategy for diversifying investments is to buy shares of Exchange-Traded Funds (ETFs). ETFs can be bought and sold like stocks, but they consist of bundled stocks that track an index, such as the Dow-Jones Industrial Average or the S&P 500 Index. The Dow-Jones average tracks 30 major publicly owned companies based in the United States. The SPDR Dow Jones Industrial Average ETF with stock symbol DIA seeks to provide investment results that correspond to the price and yield performance of the Dow Jones Industrial Average. Buying shares of the DIA ETF is equivalent to buying shares in all 30 of Dow-Jones component stocks. The Spider (SPDR) ETF with the stock symbol SPY tracks the performance of the 500 stocks that comprise the S&P 500 Index. The internal expenses of Exchange Traded Funds are usually considerably lower than those of mutual funds. In addition, ETF purchases are free of broker loads, whereas mutual funds normally have commissions and loads associated with them - this is money that you have to pay just to be able to buy shares of the fund. The tax consequences of an ETF only occur when it is sold, regardless of how long you own it. Your tax liability for an ETF is calculated by subtracting the price that you paid from the price at which you sold it – just like for a stock. By contrast, it may be necessary to pay taxes every year for mutual funds because the capital gains from fund management transactions are reported to the Internal Revenue Service by the broker on a yearly basis. The worst case happens when you sell at a loss a mutual fund that had been doing well when you bought it, but now has gone down in value; you not only lose part of your capital – you may also need to pay taxes on the capital gains accumulated from fund management transactions while you held the fund. The percentage of new companies that are successful and which maintain a growing price per share is small. New companies face many managerial and technical challenges that can affect their bottom line adversely. New stocks should be avoided because they don't have a proven track record, but you can miss great opportunities by not investing in new companies. When Google made its initial public offering (IPO), the stock price was around $88 Dollars in 2004. A share of Google stock on October 1, 2007 sold for over $580 Dollars. With regard to Initial Public Offerings, Google represents an exception, rather than the rule. If you really, really would like to take advantage of the growth prospects of new stocks, you should not risk more than ten percent of your total capital, and you should be ready to sell if the stock loses more than ten percent of its value. Facebook provides an example of the negative surprises that can happen to the stock value of a new company. Facebook stock went on sale on May 17, 2012 at $38 dollars per share. The value dropped 30% within a month, and six months later, the stock had lost 40% of its value and sold for $22 dollars per share. Even one year after its IPO, Facebook stock was at $26.25 which was 30.9% below its initial price. Loses like this may never be recovered or may take a long time to recover. In the case of Facebook, the stock price exceeded the IPO price by August 20, 2013 and started growing steadily. Patience is rewarded when you own shares of a successful company. Companies pay dividends as a reward to their shareholders. A company that cannot afford to pay dividends is probably not profitable enough, but there are exceptions. Growing companies need all the capital that they can get to be able to expand. It may be cheaper for a company to avoid paying dividends than to get a loan. In any case, stocks that don't pay dividends usually show that the company does not have confidence in its financial performance. Stocks which have low volume usually have great volatility and the prices can be affected sharply by relatively small transactions. Sometimes these stocks are manipulated with "pump and dump" schemes where one or more traders buy the stock at a low price and inflate the price through promotion and hype. When more investors start to buy the "hot" stock that is quickly increasing in value, the original traders sell their shares to get their profit. The stock price then drops and the latecomers are left with worthless stock. The Price to Earnings ratio (P/E) is the company's share price divided by its per-share earnings. A P/E of 15 indicates that the price of the stock is 15 times the value of the per-share earnings. P/Es are usually computed with trailing earnings, i.e, earnings from the past 12 months. The P/E reflects the relative ability of a company to make money; it represents the number of investment dollars required to earn one dollar. A stock with a P/E of 20 is considered a better value than a stock with a P/E of 40 because dollar-for-dollar a stock with a lower P/E value has greater earning capacity. In general, prosperous companies have larger EPS values than worse performing companies. The value can be negative if the company has more expenses than income. A long-term chart is very useful for determining the sustained performance of a stock and for identifying the frequency of splits and the time required for the stock to double in value. 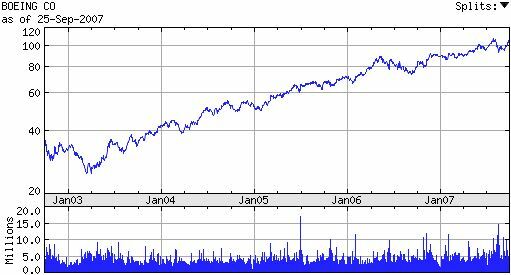 This is a 5-year chart of the stock price of the Boeing Company (BA) obtained from Yahoo! Finance. Although there are no splits, which would normally make the price per share more affordable for average investors, the stock shows consistent, steady growth that doubles in value approximately every three years. Notice that the price of $40 dollars at the beginning of 2004 passes the $80 Dollar mark toward the end of 2006. If you had bought this stock at the beginning of 2004, each share of stock would have increased in value from $40 to over $100 Dollars by October 2007. This is an increase of 150% in the value of your investment. In addition, during this time you would have received an additional 1.4% of the value of your investment paid as dividends. Below is the 5-year chart for Microsoft (MSFT) for the same time period. The price of the stock shows erratic fluctuations during the complete five-year period. If you had bought this stock at $28 Dollars at the beginning of 2004, you would basically have the same amount of money by October of 2007, almost 4 years later. Your only benefit would have been the dividend payments of 1.5% on your investment. Notice that the EPS for Microsoft is over three times smaller than the EPS for Boeing. Over short periods of time, stock values may be quite volatile. Prices can go up and down depending on current economic circumstances and the mood of Wall Street investors. But over long periods of time, the stocks of stable companies tend to grow. This is reflected in the rise of the Dow-Jones Industrial Average for the last hundred years. A good strategy for successful investment consists of buying and holding for a long time stocks of good, solid companies that produce products or services that have great demand. This is the strategy used by professional investors, such as Warren Buffett. Even good companies go through up and down periods. A stock may increase in value in response to new or expanding markets and it may lose value when the demand for a product decreases or when unfavorable financial or ethical news are revealed. When a stock is not performing well, you should think of selling it and acquiring another stock that meets your goals better. A stock that has been losing value for three months could drag down the overall performance of your portfolio, and it may be better to sell it and exchange it for a better performing stock rather than wait for the loser to go up in value. Holding for the long term does not mean that you should suffer losses when there are better opportunities in a rising market. In an interview with AARP Magazine, Warren Buffett said that you should pick stocks of businesses that are so good that it should not matter who is running them. Investors should avoid buying fads, crummy companies, and not try to time the market. Sound businesses that deliver goods and services will continue to generate income over the long term, and most investors will benefit from buying index funds and holding them over a long period. Buffett considers that bonds are bad investments due to inflation and currency volatility. He points out that U.S. Treasury bills have not produced real income for the past 47 years after taking into consideration taxes and inflation. Buffett also does not think that gold is a real investment because an equivalent amount of money can buy other assets that appreciate in value and produce income. Gold has been esteemed as a precious metal since ancient times because it does not oxidize. In the past, gold coins were minted for general circulation. The value of gold bullion fluctuates depending on market demand. Some people buy gold coins or gold bars as a hedge against inflation when they fear that currency values will drop. In addition to their bullion value, gold coins may have numismatic value based on their rarity and condition. However, gold is not recommended as an investment for people who are unfamiliar with precious metal markets or the valuation of numismatic coins which is quite subjective and sometimes arbitrary. Market timing is the strategy of making buy or sell decisions by attempting to predict future market price movements. There are many market conditions and unforeseen events that can affect future prices of stocks, such as wars, earthquakes and hurricanes. It is stressful and costly to buy a stock that loses significant value shortly after you purchased it. Some investors use statistical criteria, such as moving averages, to try to avoid bad surprises. The chart above shows the price of Caterpillar Inc. (CAT), which is a component of the Dow-Jones Industrial index from January to April of 2015. The purple line shows the 200-day Simple Moving Average (SMA) and the blue line shows the 20-day SMA. The consistent upward trend of the stock above the 20-day SMA during April is a positive indicator, whereas the general downward trend of the 200-day SMA can be interpreted as a limit of how high the stock may rise before encountering resistance. Such analysis may suggest that the stock may rise by 10 points within a month if the trend continues. Whether this is the right signal to buy the stock will depend on your investment objectives. In a situation where the 200-day SMA is falling, investors who are more interested in holding for the long term rather than on frequent trading would probably prefer to invest when the 15- or 20-day moving average crosses above the 150- or 200-day moving average because this would be an indicator that the long-term downward trend is ending. Keep a broad perspective when buying. Some traders say "don't catch a falling knife" because you can get hurt. It is good to buy low, but make sure to study the fundamentals to confirm that the stock can have future growth and that the stock will not continue to fall. A falling stock occasionally will bounce and fool investors into thinking that it is recovering. This may be due to short sellers covering their positions, giving the impression that the stock is now going up. Short sellers try to make money by borrowing a stock from their broker when the price is high and returning it when the price of the stock has fallen, pocketing the difference minus fees. Once the short-covering ends, more selling may follow and the stock value will continue to plunge. Stay away from such stocks, but if you should buy one, dump it quickly to minimize your losses. If your analysis of the fundamentals was correct, you can buy the stock later when the value has stabilized at a lower price and if you still think that the prospects for growth are good. As an exercise to get experience in picking stocks, you should try to select the three best performing stocks of the Dow Jones Industrial Average using the criteria discussed above. Once you have selected the top three stocks, write down the cost of 100 shares of each of your three stocks. Track the prices and the value of your investments on a weekly basis for three to six months to determine if you would have made or lost money. When you have confidence, you may try it with real money by establishing an account with a broker such as ETRADE, Scottrade, or Charles Schwab. Before making a final decision, it may be useful to read analyst opinions, or reference the ratings provided by stock broker firms such as Schwab and others. Also, look at the "short interest" for a stock; this provides a measure of how many investors have a negative opinion about the company and are betting that the stock will go down. If you are inexperienced, you may be tempted to act on the recommendation of a business guru or someone's tip. Be careful! Always go through the basics of checking whether the stock has the attributes that you desire and the level of risk that you are willing to take. Don't be in too much of a hurry. The opportunities for good investments do not disappear overnight. Remember that buying is easy. It is a lot harder to sell at a profit. Before signing an agreement with an investment manager, you have to understand that the manager will not guarantee that your investments will grow. You will be charged a percentage of your total assets just for letting some "expert" manage your money. It is not unusual for an investment advisor to charge 1% to 2% a year to manage a $500,000 portfolio. That is $5,000 to $10,000 per year with no guarantee of a profit. In addition, an asset manager that buys and sells stocks may collect extra commission fees for stock trades. Sometimes customers wonder whether the trades are done for the benefit of the portfolio or just to generate commissions for the asset manager. Active trading can also have expensive tax consequences. Short-term capital gains for securities that are held for one year or less are taxed at a higher rate than long-term capital gains. Think hard and calculate the costs before you hire an asset manager. You may come out ahead managing your own money. Investors lose millions of dollars to unscrupulous or unlicensed financial advisors every year. Some of these agents may contact you by phone in telemarketing campaigns and promise great yields without risk. Beware! Avoid scams and Ponzi schemes. Before turning over your investment funds to an agent or a company, check them out in investor.gov. This is a web site set up by the U.S. Securities and Exchange Commission that provides free background checks about investment professionals. Do not give your money to unlicensed agents. A stock broker can advise you about buying stocks, but with preparation and confidence you can make very intelligent decisions yourself. Buying stocks is always risky, whether you use a broker or choose the stocks yourself. The historical performance records in the charts provide very useful insights for picking stocks, but as they say in the trade: "Past performance may not be indicative of future results". There are always uncontrollable external factors that can cause panic selling and bring prices down. Times of instability such as the 09/11/2001 World Trade Center disaster or the sub-prime credit bank crisis of 2007 erode investor confidence and cause stock prices to drop. During these times, investors who have a long-term perspective are able to acquire good quality stocks at good prices.